Fish Photos & Info - All about fish & Seafood. Photos, info, catching, cooking - by species. from some of the BEST PLACES TO FISH ! 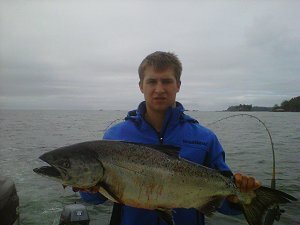 24th June, 2011: FISHING REPORT: Port Alberni Inlet, Barkley Sound, Ucluelet (West Coast), Somas-Stamp River System. It is past mid June and as expected the salmon fishing in all of the Port Alberni and Pacific Rim areas has really picked up. Halibut and Chinook fishing on the west coast has been very consistent with most days producing some very good results for those on guided trips or fishing in privately owned sport boats. Barkley Sound especially along surf line locations has been fantastic with some great Chinook catches in the high teens and low twenties. The Port Alberni Inlet has also picked up with some excellent sockeye fishing. The Somass River and Alberni Inlet water temperatures are still relatively cool in the River but surface Inlet water temperatures are now about 61 degrees Fahrenheit. There has been an abundance of early Sockeye moving into the Inlet and then the River which has produced some Sockeye schooling and some great results for sport anglers. 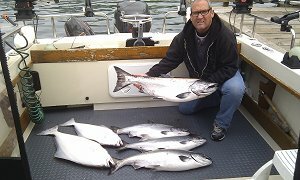 The 2011 summer fishing should once again be fantastic along Vancouver Islands west coast inshore and offshore and inland waters close to Port Alberni. Results to date have proven pre season forecasts to be very accurate. The Port Alberni Inlet is expected to see a good return of Sockeye Salmon in 2011. The Department of Fisheries is still estimating a return of 600,000 pieces to the Somass River. With this in mind the estimated catch for sport, commercial, and first nations is approximately 225,000. For the sport fisherman the current daily possession is four salmon with a two day possession limit of eight. Many believe that returns will be close to the 2010 return of well over one million salmon. The early run of Sockeye to date is proving day after day that this thought by many anglers could very well hold true. With water temperatures very cool but gradually warming the Somass River and the two major lake conditions have been perfect for good migratory flow. The counters have well over 47,000 escaped Sockeye already moving into Sproat and Great Central Lakes. The week of June 13th was the beginning of some good Sockeye Fishing out in the inlet. Some anglers reported some good fishing with limits of eight and twelve fish per boat but without any real consistency as some anglers had a much less success rate. The Sockeye fishing during the last few days has improved even more and has been simply sensational. The Inlet waters are warming up and the fish are beginning to school in various spots. The best fishing has been from Ten Mile Point right to Dunsmuir Point which is straight across from the China Creek Marina and Campground. The magical depth range for fishing has been from twenty-five to fifty feet with forty feet being a perfect depth. As we get closer to July and the waters warm up the Sockeye will go deeper into the water. The normal Sockeye gear is currently working well as long as plenty of color is out the back of the boat. The MP 2 and 15 (bubblegum) hootchies are working, as are the pink and blue and pink and black hootchies and a variety of other pinkish to orange and red colors. We are expecting the Sockeye fishing to stay relatively good well into August. There will be Seine testing going on weekly with updates on numbers. Expect some commercial fishing in the Inlet and also to outer areas but there will always be plenty of good areas for the sport fishermen. It will not be a surprise if well over one million Sockeye return to the system this summer. Barkley Sound fishing has been very good for the last two weeks. Generally the surflne areas have produced some nice fish but some great catches have also come out of more inshore areas like Pill Point, Vernon Bay, and Swale Rock. The inland areas have produced some salmon just like the surf line spots up to twenty pounds. 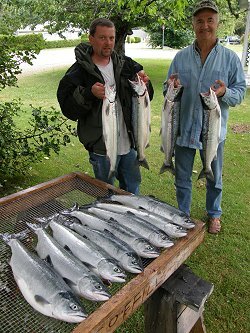 There have been reports of some great Coho catches especially close to Swale Rock. The Chinook have been in deeper water. Pill Point has reported great catches with the salmon at depths to 110 feet and the Meares and Austin Island areas as deep as 125 feet. Anchovy and a few coyote spoons in green and blue nickel and the silver glow have been working but in general the surf line spots have had the best results with anchovy in a chartreuse, glow green, or purple haze teaser head behind a glow hotspot flasher. We are expecting some Coho to move into the mix. There have been a few good days but the Coho have not been as consistent as the Chinook. Coho catches have been good up the Vancouver Island coastline and will move into the direction of the Sound. 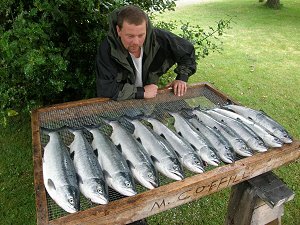 The Coho are big eaters at this time of year and often put on as much as a pound per week. We are expecting some great fishing in the Sound through July. One of the biggest runs of what is termed mid summer run Chinook are forecast to return to the big watershed systems in southerly waters. These migratory Chinook often stay relatively close to the beach of Vancouver Island and will move into Barkley Sound to feed on the rich resources of bait fish. Summer fishing in the scenic and calm waters of Barkley Sound will be wonderful in 2011. One of the most consistent areas to fish year after year for salmon and halibut has been Ucluelet B.C. Ucluelet is a small town located on the west coast of British Columbia with a relatively small year round population. However in the summer months the population size does swell with many visitors who come to fish the inshore and offshore waters. Many come on guided trips while others brave the waters of the Pacific Ocean using their privat sport boats. The fishing has been very good for Chinook and there have been some good Coho numbers recently and of course like most years the halibut fishing is really picking up. The best spots to fish have been Long Beach and recently Lighthouse Bank and the Inner and Outer South Bank. The salmon like the halibut have been very close to the sandy bottom and on tide changes do move up to the midwater to feed on the needle fish and other bait fish. The fish are actively feeding much of the day but on the tide change it can become crazy and it often seems that whatever one offers as a lure will work. For some fisher persons bait and for others coyote spoons and plastic seems to be the way to go. The green nickel four inch coyote spoon has been good as have several glow hootchies and also the green spatterback and T-Rex hootchie. Both of these hootchies have done well picking up Chinook and halibut. Most of the Chinook landed have weighed from the mid teens to low twenties with a few in the thirty pound range. 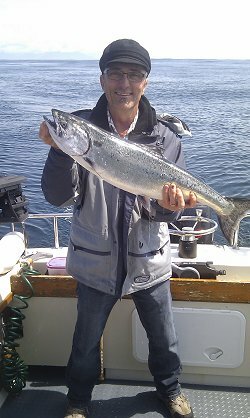 The Ucluelet ladder derby is currently showing a thirty-eight pound Chinook leading in June. This fish was landed out on the Lighthouse Bank using a glow hootchie. We are realy expecting the fishing to improve even more. Chinook abundance for the west coast of Vancouver Island is expected to be the best we have seen in the past five years. Remember that when you are out on the water fishing to be sure the lines are in the water at the magical hour of the tide change. Remember to stay safe out on the west coast and have all of the necessary equipment for foggy days and watch the winds. Those fishing Sockeye in the Somass River have done extremely well. The possession limit is currently two. Water conditions for migration are perfect. The fall river fishing is expected to be very good. Chinook, Coho, and summer run Steelhead are sensational with good numbers forecast to return. Salmon fishing for chinook is expected to open on the 25th of August this year. Good fishing will occur in September using conventional methods with the best fishing on the fly usually in October when the natural spawn takes place. If you are interested in guided river trips don’t wait to long as much of the available room is quickly disappearing. For problems or questions regarding this web contact Email.